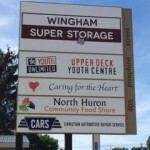 The North Huron Food Share is located at the back of the main building at 405 Josephine Street. Look for door 405-D.
North Huron Community Food Share is with Joyce Johnston. North Huron Community Food Share shared a post.